Our clinic offers physiotherapy for back pain which can help with your cervical spine problems. The cervical vertebrae are numbered from C1-C7 and carry the weight of the human head – between 8 and 15 lbs. The first two vertebrae have particular names – C1 is known as the atlas and C2 the axis, which has a tooth which articulates with the atlas. 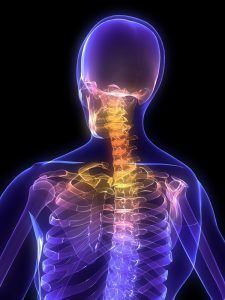 The cervical vertebrae are very delicate bones which are reasonably well protected by strong ligaments and muscles whilst still allowing free movement. The cervical section of the spine is the most mobile part of the whole spine. Movement consists of 90′ flexion (looking down) and extension (looking up), 180′ rotation and up to 120′ side flexion. In between each vertebra is a disc that acts like a spacer between the bones and from small holes (called foramen) on the right and left of each vertebral body exit the nerve roots (like tree branches) from the spinal cord. These contain sensory and motor nerves which feed the head and arms. Our physiotherapy for back pain can help treat the thoracic spine, which refers to the upper and middle back; it consists of 12 vertebrae and 12 discs in between each vertebra. It is built for stability and has limited flexibility due to the rib cage – this provides protection to the vital organs which sit inside it. The ribs attach from T1-10 in a curve and attach in the front of the chest to the sternum (the breastbone) – note the bottom 2 ribs are known as floating ribs as they do not attach to the sternum. For even greater stability the discs in the thoracic spine are flatter than those in the cervical and lumbar spine. The spinal canal is narrower in the thoracic spine and the spinal cord is therefore more at risk of damage if a thoracic vertebra is injured. Give us a call on 01582 761448 or get in touch if you’d like to find out more about how our physiotherapy for back pain can help you with any head, neck or upper back issues you may be experiencing.